Windows & Wardrobes. | A trek through the world of children's films and literature. A trek through the world of children's films and literature. “Which meant it all had to do with Tally Youngblood” – the problems I had with the “Uglies” trilogy. You should know that this is not how I intended to begin this blog. I was planning a calm introduction by discussing my favourite literary hero from a classic novel. My words would come across as considered and reasonable. I would contain my excitable rants until a much later stage when my readers (or reader, I’m not overly ambitious) would know that excitable rants were not the norm. This was until I came across the Uglies series by Scott Westerfield. I had a vague idea about the plot and it sounded interesting. There are four books in the series, the first three books form a complete trilogy and the fourth book is set some years after the events of the third book with different characters. It was all I could do to finish the trilogy so I skipped the fourth book. Nearly every aspect of these books frustrated me – the plot, the characters, the terminology and the ham-fisted attempts at social commentary. A discussion on classic heroes could wait; my many issues with this series could not. 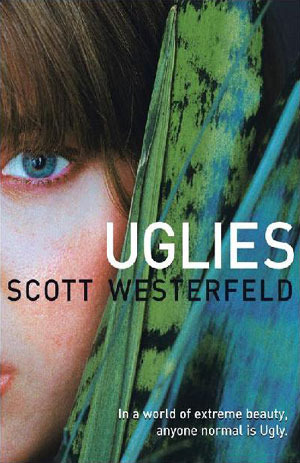 For those of you unfamiliar with the Uglies series, the premise is that many years after the fall of our society, a new society that values beauty and passivity has taken its place. The government bands all pre-teens and teenagers “Uglies” and gives them a mandatory surgical operation to beautify them at the age of sixteen. After this operation, the Uglies, now known as “Pretties” leave their hometown of Uglyville and move to New Pretty Town where they spend their lives living in the height of luxury. (These are all real names in the book showing just how much it fears subtlety). The novel begins with Tally Youngblood, an ugly who is anxiously awaiting her operation. She befriends another ugly named Shay who expresses dangerous opinions regarding their government. Before their joint sixteenth birthday Shay runs away to join a rebel group who live outside of the government’s reach. An agent of “Special Circumstances” the city’s shadowy law enforcement issues Tally an ultimatum. She must find and give up the rebel group, including Shay, to Special Circumstances, or Tally will be denied the operation and remain ugly forever. At first glance, this book has some intriguing ideas. Westerfield points out not only the pressure placed on young people about their appearance but also how restrictive the ideal model of beauty can be. While he’s not subtle about it, he has hit upon dangerous and relevant issues. However, the moral message never really settles throughout the trilogy and this could be because the story centres on an incredibly weak character that cannot carry this message. Sinead is an MA graduate from UCC who blogs about children's books, animated films, fairytales and folklore.